Kallol and Asala’s paper is accepted to Frontiers in Chemistry! Congratulations! This work involves new first-row metal complexes supported by a redox-active NNP-type pincer ligand and their application to electrocatalytic CO2 reduction. Our latest paper, in collaboration with the Delcamp Group, is accepted to Journal of the American Chemical Society, and describes sensitized photocatalytic CO2 reduction to CH4 with our recently reported nickel bipyridyl-NHC complexes! Congratulations to Xiaojun and Kallol! The Jurss Lab receives an NSF CAREER Award to support our work on developing and understanding new molecular catalysts for carbon dioxide reduction! 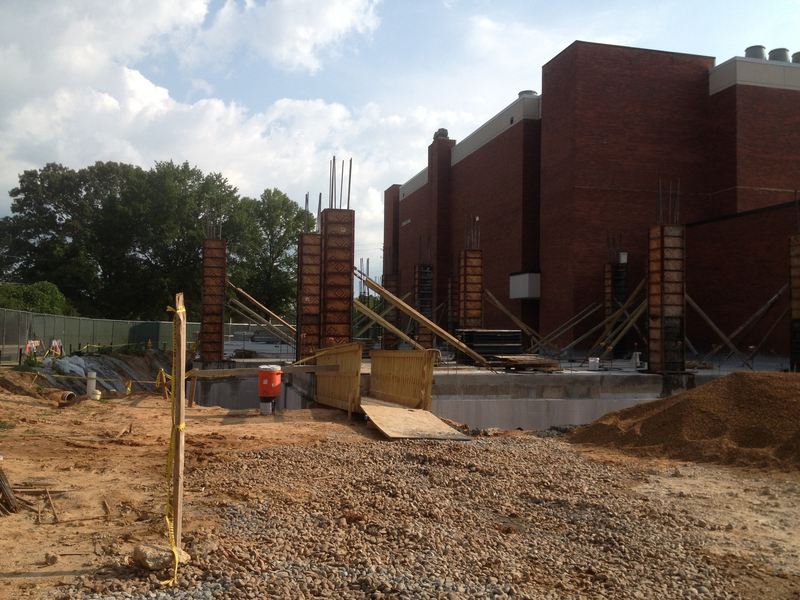 We greatly appreciate the funding from the National Science Foundation! Today was Xiaojun’s last day in the lab after an awesome and productive time over the last 2+ years! We are going to miss him and wish him all the best at his next stop at Baylor University in Prof. Caleb Martin’s research group! Weiwei and Sayontani’s paper is accepted to Chemical Communications! Congrats! This work with Jared Delcamp (UM), Russ Schmehl (Tulane), and coworkers involves anthracene-functionalized dinuclear rhenium compounds for photocatalytic CO2 reduction, where, for homogeneous Re systems, a record setting 40,000 turnovers for CO production was achieved! 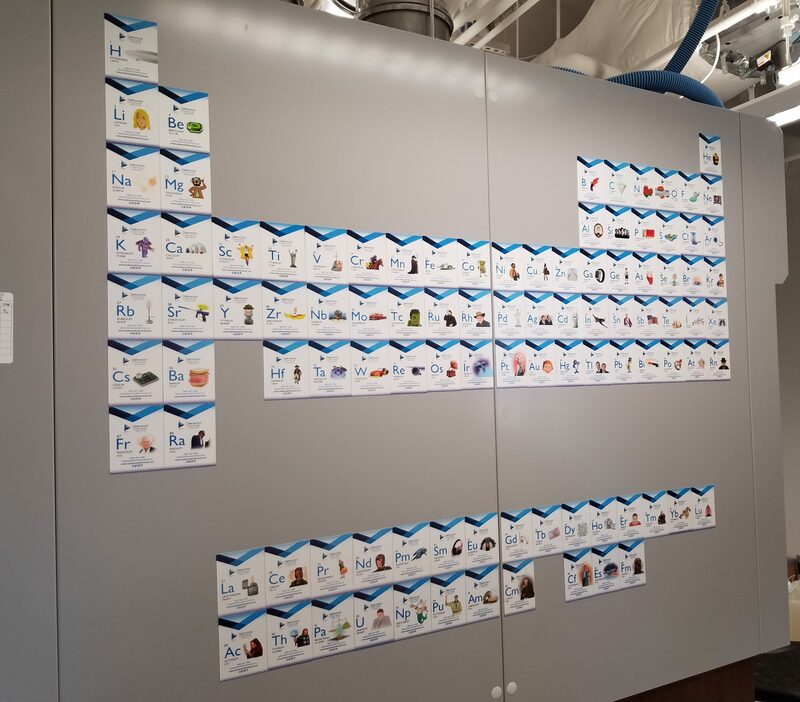 Lizhu and Xiaojun’s paper is accepted to Organometallics! A robust polypyridyl ligand was employed in iron-oxo catalyzed C-H bond functionalization and was found to have high selectivity, including high alcohol-to-ketone ratios in cyclohexane oxidation and a strong preference for the tertiary C-H bonds of adamantane. 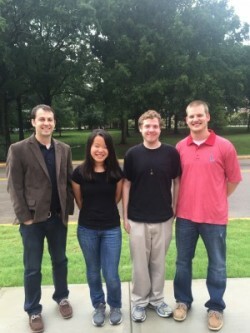 Lizhu, Hunter, and Sarah’s paper is published in New Journal of Chemistry! A novel tetradentate ligand was found to enforce high-spin electronic states and provide access to Fe(bpy)2 cores with cis-labile coordination sites! We are excited that first-year graduate student Zane Turner has joined the Jurss Lab! Welcome! Weiwei, Sayontani, Winston, and Rebekah’s paper is published in Inorganic Chemistry! This work explores the reactivity and divergent behavior of two well-defined dinuclear rhenium catalysts for CO2 reduction! We welcome undergraduate REU student Hannah Kline from Western Carolina University to the Jurss Lab! Hannah will be working with us for the next two months developing new catalysts for CO2 reduction! Congrats to Kallol for his contribution to our collaboration with the Delcamp Group involving a novel tungsten-based photocatalyst for H2 evolution, which appeared in ACS Catalysis! Xiaojun’s paper is published in Chemical Communications! This work, with our collaborator Julien Panetier at SUNY Binghamton, provides insight into the role of redox-active macrocycles in CO2 reduction through a series of well-defined nickel catalysts. Congrats! We welcome new undergraduate researchers Nicole Bay, Dawson Buettner, Katrina Gateley, and Natalie Taylor to the Jurss Lab! First-year graduate students Anthony Devdass and Shatamanna Sahil join the Jurss Lab! Welcome! The Jurss Lab has been awarded a Doctoral New Investigator grant from the American Chemical Society Petroleum Research Fund. Thanks! Lizhu, Amir, and Manpreet’s communication on cobalt-catalyzed H2 production with a first-of-its-kind pentapyrazine ligand is published in Inorganic Chemistry Frontiers. Congrats! Jonah’s article on “Cornflakes and Bioethanol” appeared in our local newspaper The Oxford Eagle! Check it out! We welcome undergraduate REU student Colleen Chernowsky from Ohio Wesleyan University to the Jurss Lab! Colleen will be working with us for the next two months developing new catalysts for renewable energy applications. Congratulations to Emily Ables, Rebekah Nelson, and Winston Pitts on graduating today! All the best to you going forward! Jonah assumes responsibilities as Chair of the local section of the American Chemical Society! Joey placed second overall in the campus-wide Three-Minute Thesis (3MT) competition from over 80 graduate student entrants! 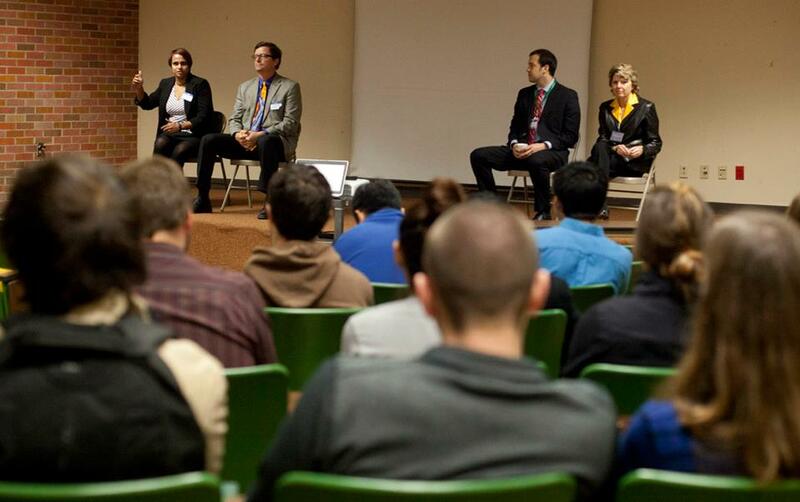 Read more about the 3MT Competition here. Great job! The Jurss Lab is awarded a Seed Grant for catalytic water oxidation from the National Science Foundation OIA-1539035. Congrats! Dr. Xiaojun Su joins the group as our first postdoc! Welcome! One of Hunter’s many lasting contributions to the Jurss Lab! This is every magnet that Oakwood makes as of today. Congratulations to Hunter for successfully defending his Master’s Thesis! All the best to you in medical school! Congratulations to Lizhu for receiving a first place award on her oral presentation at the conference this week! Weiwei and Joey also had outstanding poster presentations! Jonah’s article on “Power and Progress in Photovoltaics” appeared in our local newspaper The Oxford Eagle! Check it out! We welcome Mayukh Datta and Quriston Wilson to the Jurss Lab as part of our Artificial Photosynthesis Research Experience for High School Students summer program! Congratulations to Hunter on our collaborative paper with the Delcamp Group, “Electrocatalytic Reduction of CO2 to CO with Re-Pyridyl-NHCs: Proton Source Influence on Rates and Product Selectivities” that was published in Inorganic Chemistry! Graduate student Joseph Lee joins the Jurss Lab! Welcome, Joey! We welcome undergraduate REU student Jordan Spell from Western Carolina University to the Jurss Lab! Jordan will be working with us for the next two months developing new catalysts for renewable energy applications. A hearty congrats to Sarah, Michael, and Manpreet for graduating this weekend! Hunter, Sarah, and Amir have all been accepted to medical school at the University of Mississippi Medical Center! Congratulations! Congratulations and job well done to Manpreet for successfully defending his Honors Thesis! Weiwei receives the department’s Inorganic Chemistry Graduate Student Award, recognizing her outstanding academic work and research progress at our annual ACS local section banquet! Jonah serves as a judge at the State Science Fair, held on campus in the Tad Smith Coliseum, where ~600 students in grades 7 – 12 shared their creativity through science! Jonah is voted Chair-Elect of our local section of the American Chemical Society! The Jurss Lab is awarded a Seed Grant for catalytic water oxidation from the National Science Foundation OIA-1539035, and Rebekah Nelson joins our team as an undergraduate researcher! Lizhu, Hunter, Ryan, Amir, and Manpreet present posters at the Southeastern Regional Meeting of the American Chemical Society (SERMACS) held in Memphis, Tennessee! 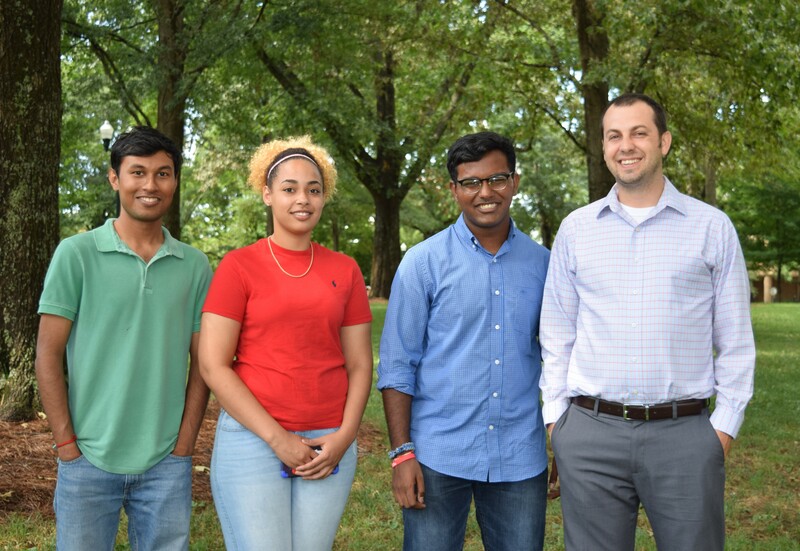 We welcome new graduate students Kayla Milano, Sayontani Sinha Roy, Kallol Talukdar, and Weiwei Yang, as well as undergraduates Michael Holland and Winston Pitts, to the Jurss Lab! Ting Li and Robert Simmons have joined the Jurss Lab as part of our Artificial Photosynthesis Research Experience for High School Students program in partnership with Ole Miss Summer College. Welcome! We welcome undergraduate Sarah Farmer to the lab! Lab bowling night! Lizhu had never bowled before and in her first game, she breaks 100 and gets a turkey! Ankita Purohit joins the lab as an undergraduate researcher! Welcome! Congratulations to lab alumni and new graduates of the University of Mississippi: Logan Bell, Allie Funderbunk, and Jackie Gledhill! Jackie presents a fantastic poster on her research at the Undergraduate Research Forum! 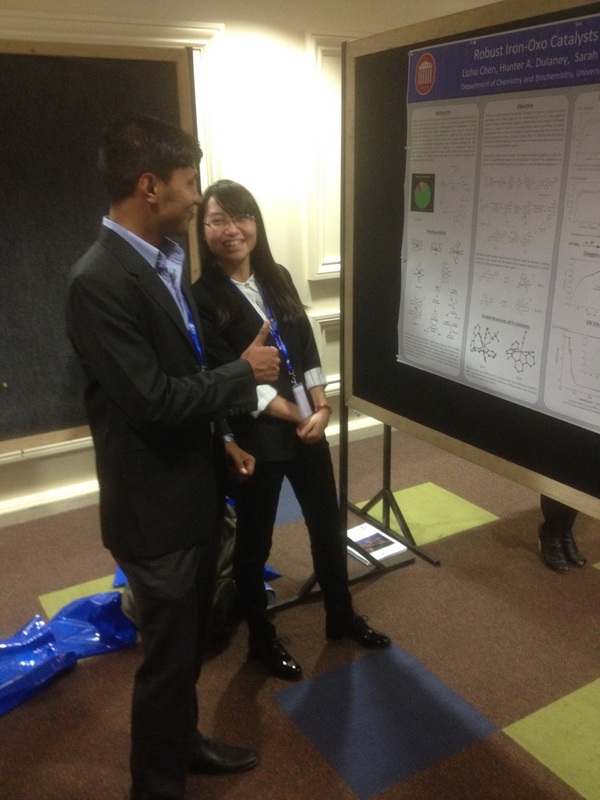 Hunter and Lizhu present posters on their research at the GSC Research Forum! Great job! Jonah serves as a judge at the 2015 Mississippi Region VII Science Fair that was attended by some 300 middle school students presenting posters on research projects from a 13-county region in northern Mississippi. Inspiring! We welcome our newest member to the lab, graduate student Lizhu Chen! Graduate student Hunter Dulaney joins the group! Welcome aboard! Jonah attends the Southwestern Regional ACS Meeting in Fort Worth! Jonah serves as an academic panelist at the Career Paths in the Physical Sciences conference at Southeastern Louisiana University! Amir Khadivi, a recent graduate of the University of Chicago, joins the lab! Welcome! We welcome Jackie Gledhill, Logan Bell, Ryan Harvey, and Ryan Higgins to the lab! Manpreet Singh joins the Jurss Lab as an undergraduate researcher and the first group member! Welcome! Jonah attends the Cottrell Scholars Collaborative New Faculty Workshop in Washington, DC! 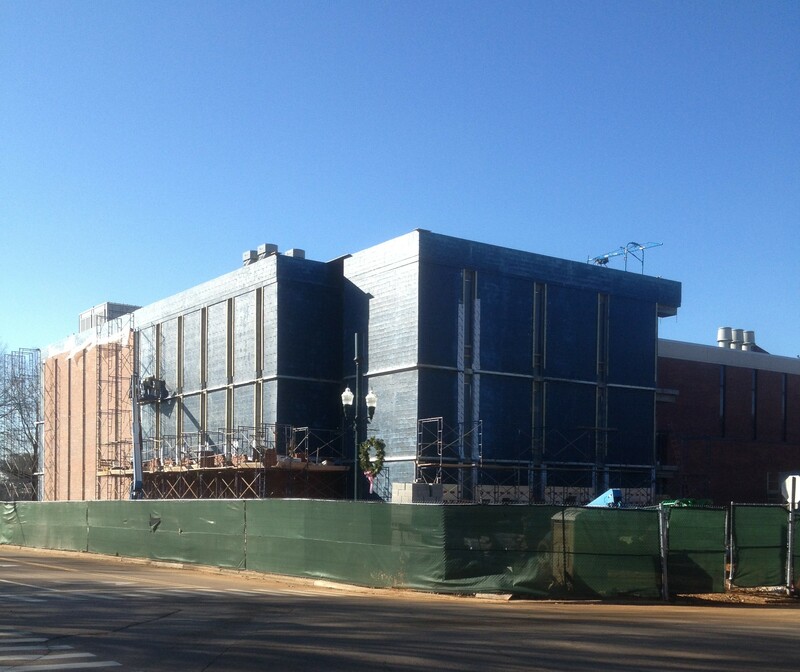 Check out the progress on our new building addition (the Jurss Lab will be on the 3rd floor featuring 1800 ft2 of lab space and 8 fume hoods)! Jonah begins his appointment as an Assistant Professor!